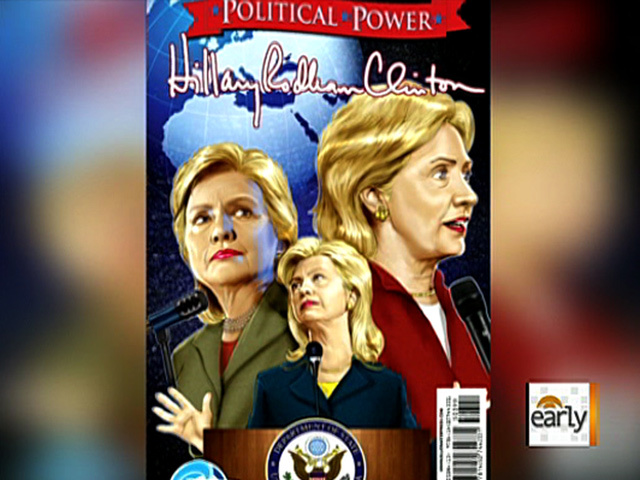 Hillary Rodham Clinton's political career has taken so many turns it has now spawned two comic books. The former first lady and U.S. senator, onetime presidential hopeful and current secretary of state is the subject of a comic book hitting stores Wednesday, the latest in a series of celebrity biographies by Bluewater Productions Inc. It's titled "Political Power: Hillary Clinton." Those previously profiled include entertainment stars like Lady Gaga and Justin Bieber, and fellow politicians from President Obama and Sarah Palin to Clinton herself two years ago. She was one of a number of powerful women who were profiled at the time. The latest comic, illustrated by Daniel Fitz, is unauthorized. Bluewater says it spotlights "the events that led to her being picked for her current position of power, Secretary of State in the Obama Administration." But publisher Darren Davis says his company is playing it straight with history and politics. "Our goal," Bluewater quotes him as saying, "is to show the behind-the scenes machinations - many of them ignored by the mainstream media - that resulted in Hillary Clinton becoming the current Secretary of State. A visual medium provides perspective that is not only accessible but more relatable to the average person without losing any of the information involved." State Department officials said they had no knowledge of Wednesday's planned release. CBS News correspondent Jeff Glor reported the story on "The Early Show."